Can Wheatgrass Turn Grey Hair Back To Its Natural Colour? Home / Natural Medicine Library / Can Wheatgrass Turn Grey Hair Back To Its Natural Colour? 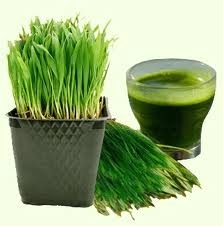 that consuming fresh wheatgrass juice regularly has been shown to turn gray hair back to its natural color? How does this happen? According to Traditional Chinese Medicine, hair pigmentation is influenced by the quality of blood and the strength of the kidneys. If your hair has gone gray, your kidneys and blood need to be strengthened. Foods that accomplish this include wheatgrass and any food with high chlorophyll content. Wheatgrass refers to the young grass of the common wheat plant, Triticumaestivum. Its leaves are juiced or dried into powder for human (or animal) consumption. It is often available in juice bars and smoothie restaurants, and is taken alone or mixed in fruit and/or vegetable drinks. Fights tumors — Studies show that wheatgrass juice has a powerful ability to fight tumors without the usual toxicity of drugs. Blood builder — An important aspect of the chlorophyll in wheatgrass is its remarkable similarity to hemoglobin, the compound that carries oxygen in the blood. When the chlorophyll is absorbed in the human body, it is transformed into blood, which transports nutrients to every cell of the body. Note: Some health practitioners claim that you can double your red blood cell count just by soaking in chlorophyll. Renowned nutritionist Dr. Bernard Jensen found that wheatgrass and green juices are the most superior blood builders. In his book Health Magic Through Chlorophyll from Living Plant Life, he cites several cases where he was able to double the red blood cell count in a matter of days merely by having patients soak in a chlorophyll-water bath. Even more rapid blood building results occur when patients consume wheatgrass juice and other chlorophyll-rich juices regularly. Some consumers who use wheatgrass for therapeutic purposes grow wheatgrass in their homes, and extract the juice using a wheatgrass juicer. The average dosage is 1 to 2 fluid ounces of fresh-squeezed juice once a day (or 3 to 4 times a day for detoxification); or 1 tablespoon wheatgrass powder (1 to 3 times a day); or 7 to 10 wheatgrass tablets (500 mg) a day.